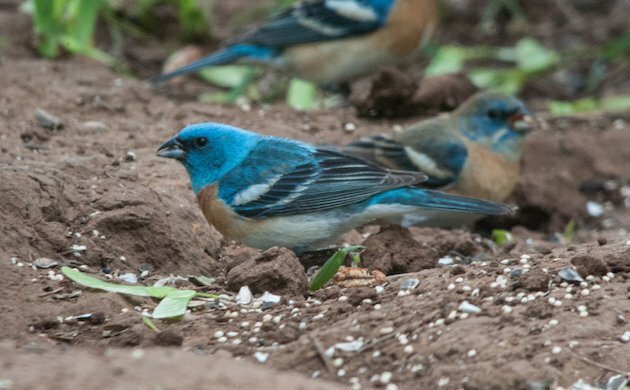 During March and April the Lazuli Buntings (Passerina amoena) begin showing up in Southern California but we don’t usually see them up north until May or June. The bright turquoise blue head, contrasting rufous breast and conspicuous white wing bars make the mature male Lazuli Bunting easily recognizable (click on photos for full sized images). The female is not as flashy or as easily distinguishable as the male but is beautiful in her own right. 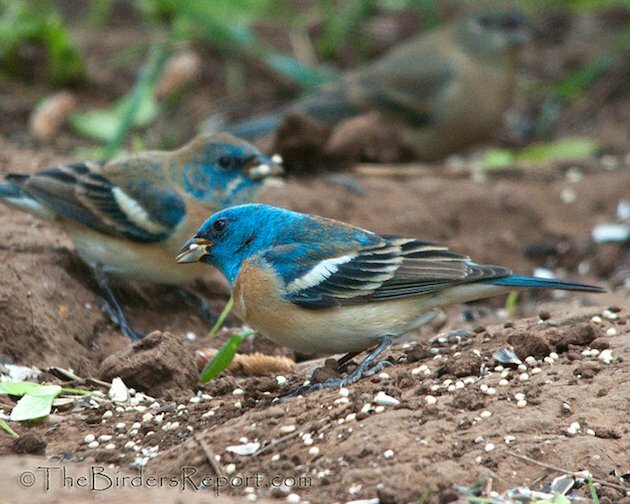 The Lazuli Bunting breeds in brushy habitats from sea level to more than 3,000 meters throughout the western United States and southwestern Canada. They are aptly named for the semi-precious gemstone Lapis Lazuli, however the males exhibit delayed plumage maturation and do not attain full brightness until 2 years old. Note the black upper mandible in contrast to the pale blue lower mandible. This is most likely a yearling male. Note the brown feathers on his nape and back and the buff tips on his greater coverts. Yearling males tend to have paler and duller blue feathers with brown or buff tips, especially on the head, nape, and back, resulting in a dull blue-brown, blotchy appearance. This is even more apparent in the bird in the background of this photo. 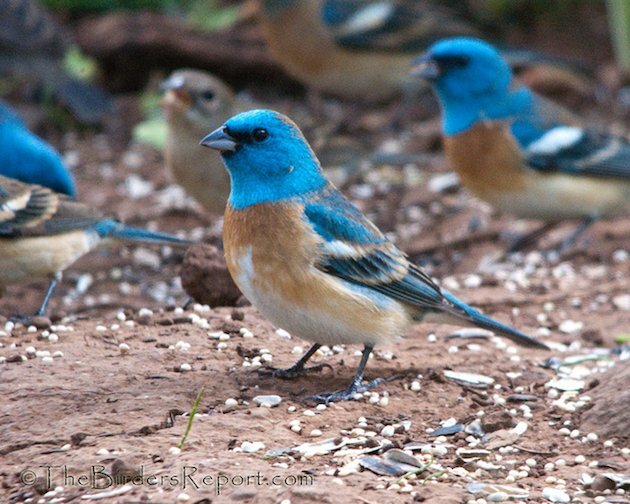 If you live in the western United States, or visit during the summer months, these bright blue gems may be seen at backyard bird feeders. This flock was photographed in a friends yard. Isn’t it nice to have friends that feed their local birds? So interesting to see the plumage transition! Buntings do have interesting molt schedules. Adult male Panited Buntings take 2 years and, sometimes, 3 years to be rid of all of the green. 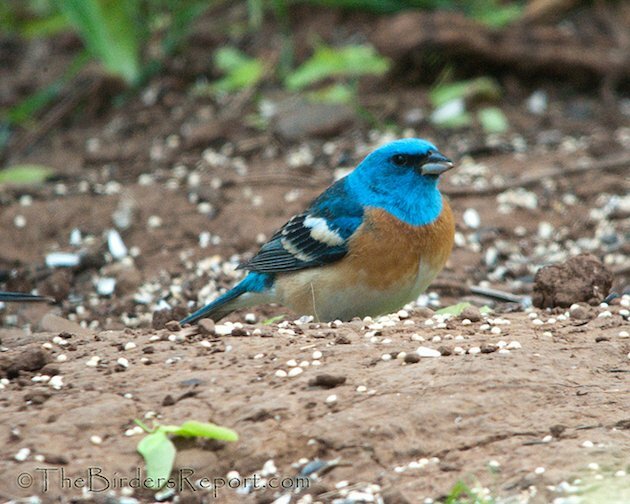 According to my observations, many male Indigo Buntings take 2 years, also. Nice piece. They instantly reminded of a bunting I was shown in S. Mexico in January, Rosita’s Bunting. The male Rosita’s is stunningly coloured, the back is the same beautiful (perhaps a bit deeper) blue, but the breast has all the colors of a magnificent sunset from crimson morphing to orange. 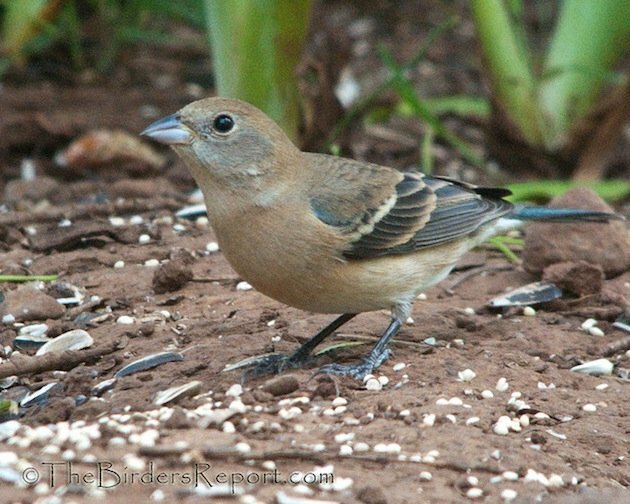 The worst of it is that Rosita’s Bunting is found only in a very small range of mountains near Tehuantepec in the state of Oaxaca. Its range actually seems to pick up not far from where Lazuli Bunting’s ends. Thanks for the additional information Peter. That Rosita’s Bunting or Rose-bellied Bunting is a beautiful neotropical species. That is a great bird to have seen as they are listed as Near Threatened (NT) on the IUCN red list due to habitat loss. I’m afraid the map needs to be revised. We often see Lazulis in Oklahoma. A couple of years ago we had large flocks of males stop in during the spring migration. I had 7 in my yard on any given day. You may have noticed that the map is six years old but I don’t know how often range maps are updated Roy. Thanks for your update though! It’s always nice to have some brightly colored birds visiting the yard isn’t it? Beautiful birds. I was able to get a shot of a male Painted Bunting, male Indigo Bunting and a male Lazuli all on the feeder at the same time. I will post it as soon as I can. Once in a lifetime occurance. Awesome Roy! I’d love to see that! Regarding the range map, I think it’s best — for any species — to look upon a range map as a general indication of where a species can be found, especially at the edges, and not a definitive statement. 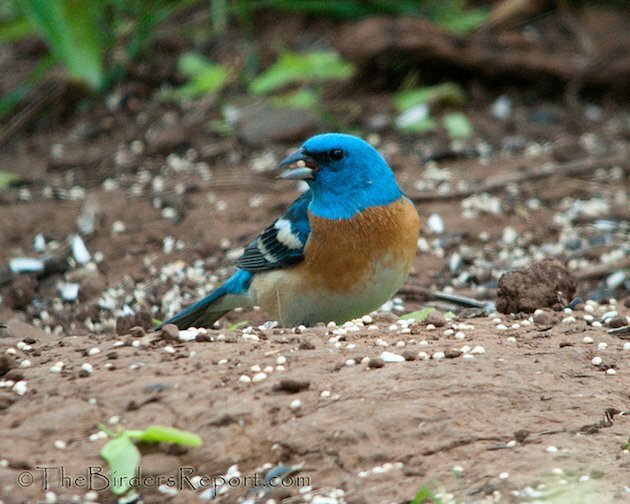 I have seen two Lazuli Buntings in Canada: one in July 2000 in Medicine Hat, Alberta, and one in July 2013 in Surrey, British Columbia. Both places are “out-of-range,” according to the map. But the males, in all their glory, were certainly there when I saw them. I have noticed that sometimes the birds don’t read the maps. 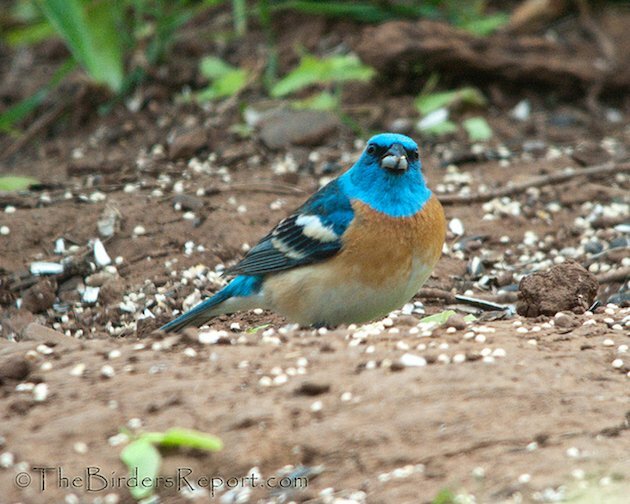 Nice gallery of Lazuli Buntings! It would be a challenge to stop looking at the feeder if I had those as a yard bird. Thanks Pat, I’m with you on that. It’s been a long time since I had these guys in my yard. Lucky I have a friend who gets them nearly every year.